Laura Handy is a 28-year-old married mother of one who lives in Stourbridge with her Husband and daughter Ayva . On Saturday 28th June she will be fighting for Ultimate Impact [UIC 12] K1 Flyweight Title against Cheryl Flynn at GL1 Leisure centre in Gloucester. Born in Wordsley and raised in Blackheath, Laura and her older sister who both used to swim for Oldbury Swimming Club, would train for four/five times a week then come the weekend it would be Gala time, ‘I think that is where my competitive nature comes from, not necessarily with my sister, but as we were always used to competitions with other clubs’. Competiveness, I would say runs in the family with Laura, who, also has a younger brother [Dan] who is a black belt in Judo and has represented Team GBR in Judo in his teens, ‘Dan has not competed in the last few years due to university commitments but has travelled to Germany and Belgium amongst other countries whilst representing Team GBR’. 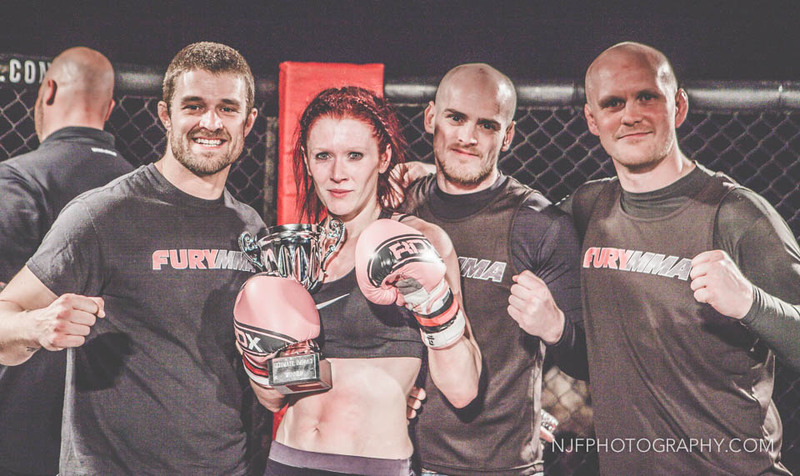 Laura currently trains out of Fury MMA in Stourbridge under head coach Ryan Norwood, who is a veteran in the sport, having had 10 professional fights going back to as early as 2002. Laura being the very supportive wife that she is [Luke and Laura have been together for 11 years married for four of those years] used to go and watch husband Luke play football, ‘When we first moved into our house Luke would go and play a lot of football and I would always go and watch; stand on the side-lines in the rain, snow, sometimes the sun [laughs] and all I would hear about would be football’. Deciding she was getting real bored of football pretty quickly, Laura needed to do something for herself, in steps, Ryan Norwood, who was advertising his new gym Fury MMA, it happened to be just around the corner from where Laura lived, she thought she would give that ago ‘I was the only girl there and got on really well with Ryan and the other lads that attended, I then got addicted to it really and trained for fun for a year before having time off to have my daughter Ayva. When I returned the same year [Oct 2012] Ryan asked if I wanted to fight, I was like ‘of course’ [laughs]’. Having had no inter-club fights under her belt, Laura got straight into ‘fight’ training mode, for which Laura has already been making huge sacrifices for the sport she has now fallen in love with. Working full time [Thursday – Mondays] in Sales for a Building Contractor selling New Build Houses; her Husband Luke owns a Cleaning business in both the domestic and commercial field, whilst also spending as much quality time with two-year old Ayva as possible. Laura fits her training in around the time Ayva has gone to bed and before she gets up in the morning so she is not missing out on spending time with her. That in itself is dedication. But, Laura took it one step further and added in weight training to her usual regime ‘I started going because my debut fight with Asha Patel was at 62kg. I was struggling to stay at 62kg, with all the extra training the weight was just dropping off so I thought of just going to lift some weights and I got in touch with a friend of mine Em, who used to train some body builders and she started training with me’. 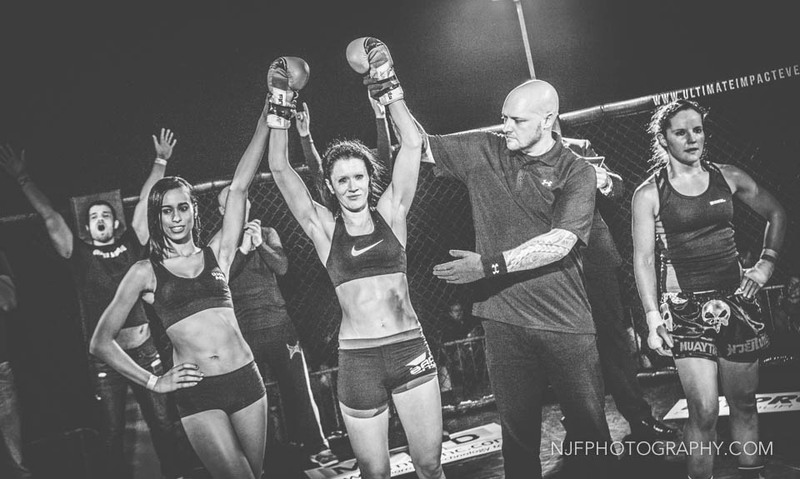 Laura had her first K1 fight for Ultimate Impact Fight Night 1 on 10th August 2013 against Asha Patel and won via Unanimous Decision. Next up was Ultimate Impact 10 and Laura’s opponent was Sammy Donnelly, fighting at 58kg in a K1 fight, so again Laura incorporated her new found ‘dedication’ of weight training into her routine. ‘The shape of my body has changed so much from just weight training, I like the look, the way my muscles fill out, and it is a little bit addictive [laughs], as soon as you start to see your body change you get addicted to that. At 58kg people said I looked scrawny and that was another reason, I wanted to build some muscle. I did not want to look scrawny or skinny at flyweight I just wanted to look toned and lean more than anything else. I am competitive not just against other people but with myself. Every time I go I like to do that very bit more, try a different thing just to push myself that little bit more, it’s all part of the training for me though, I wouldn’t go into a fight not knowing I haven’t put 100% in and I think that adds to my strength, agility and cardio. I find it does help with the weight cut as well. The more lean muscle you have the easier you have to drop your weight, well that is what I find anyway’. 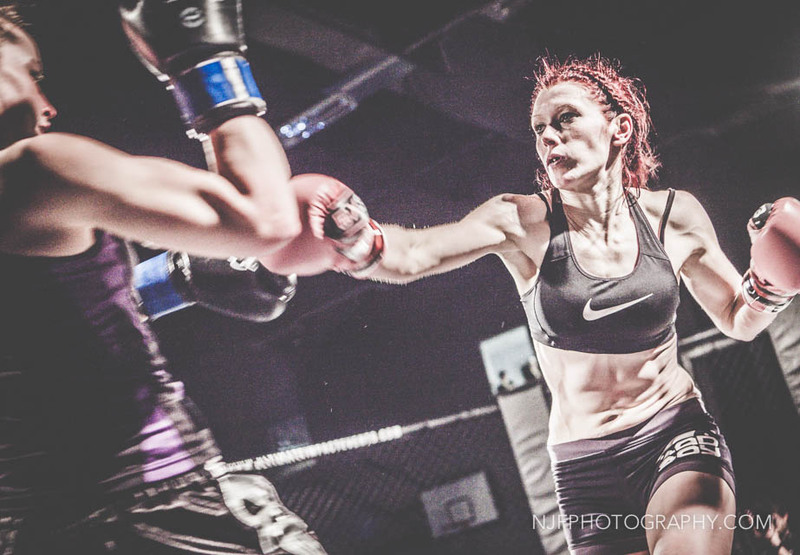 Laura won her second K1 fight against Sammy Donnelly on 16th November 2013 at UIC 10 via Unanimous Decision. After that fight, it was announced that Laura would be fighting Anya Baker for the K1 Flyweight Title Eliminator on February 22nd 2014 on Ultimate Impact 11. 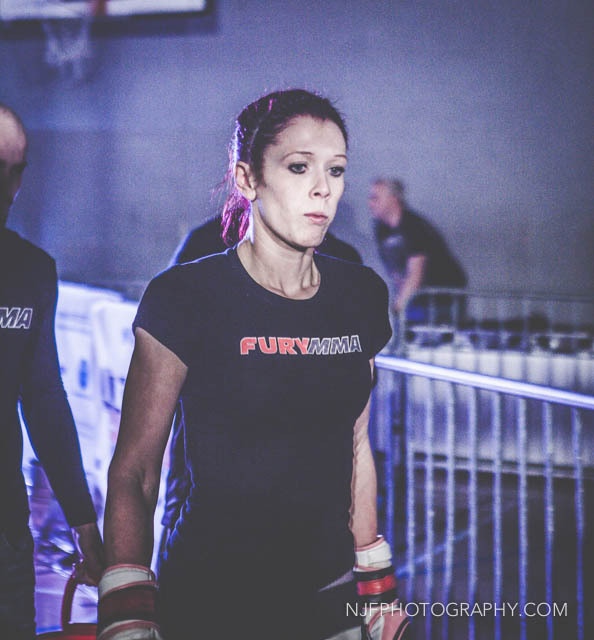 Laura fought Anya Baker on February 22nd 2014 at UIC 11 and won via Unanimous Decision, she would now be fighting Cheryl Flynn on June 28th at UIC 12 for the first ever female Flyweight K1 Title. Learning from her past fights, Laura now knows how she is going to train for this title fight, ‘My problem with the way I dealt with Anya’s fight, was that I kept watching her fights over and over, therefore it did not help me with my nerves. This time my coaches will be the ones watching the tapes over and over and I will just go in their direction’. Knowing that Laura will be filled with emotion for her Title fight on June 28th 2014 she stated, ‘When it was announced that it was going to be a title eliminator against Anya at UIC 11, I was so nervous I couldn’t get it out my head. I just needed to get through this fight first then concentrate on what happens next, but I suffer a lot with nerves; I will be a bag of nerves on the day. I think if you did not get nervous, it does not mean enough to you’. Also adding ‘before the last fight against Anya, Chris Hipkiss, Ryan Norwood and Adam Cartwright had a little chat with me about my nerves just to get me through the first 15 seconds and then said you will be fine; all through the day they had to keep saying little things to me. I was close to tears all day but I got there in the end’. ‘As a girl, I do wear my heart on my sleeve and I do tell people how I feel. The fight was quite near the end of the night as well; it is the whole build-up of it that makes me nervous; if I could just get in there be the first one on, get in and out and get it done I would probably feel a lot better about it but it is all part of it. Once I am in there, and the ref says off you go, I love every single second of it. It is just getting past those nerves to begin with. I do not want to make a fool of myself or let anyone down. Every fight I’ve gone into I know I have trained my hardest, and I have put in every hour I possibly can’. Laura also gives a lot of credit to Ultimate Impact, ‘It means a lot that Paul Sutherland and Dan Richards have thought enough of the girls fights to think they need recognition for what we have achieved so far. I think all the girls’ fights on all of the UIC shows everyone has enjoyed them. Every single fight has been worth watching and matched fairly, it means a lot that Paul and Dan have put that together and said you guys are good enough to have a title shot at UIC’. 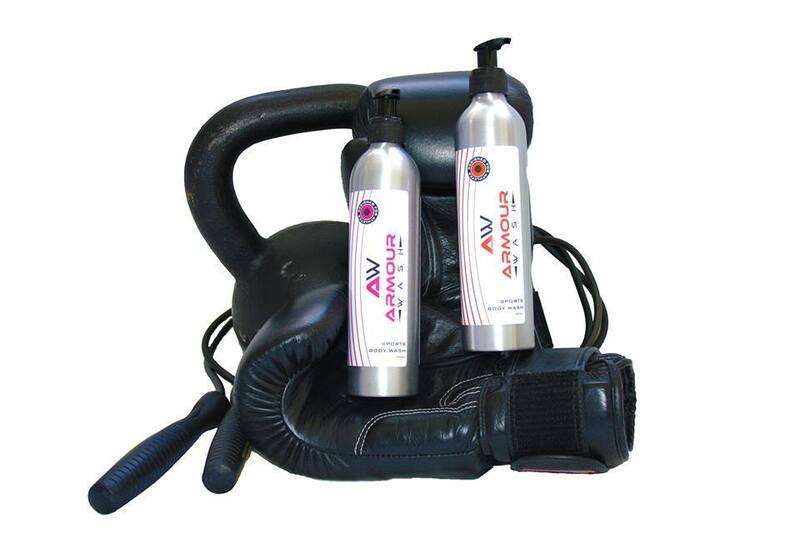 Ryan Norwood, Chris Hipkiss, Wayne Drake, Karl Evans, Matt Harthill, Lee Sherwood, Adam Cartwright everyone at Fury MMA, my husband who has been to all my fights and does not moan that I am off out training all the time and my New Sponsor Armour Wash. Ultimate Impact 12 is this Saturday June 28th at GL1 Leisure Centre, Gloucester, tickets are available online on the below link.